Your performance today was wonderful. Please thank all your fellow members of the Pyramid Brass Quintet. I really appreciate your coming to RES. You opened the eyes and ears of our students to marvelous opportunities. Not only did you entertain, you also taught the students! Thank you! The members of the Hendersonville Senior Friendships Club wish to thank you and the "Pyramid Brass Quintet" for the wonderful evening of entertainment you provided for our group. 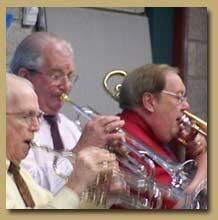 What a pleasure it was to have you performing those great Gospel, Dixieland and Opera musical pieces! We especially enjoyed "Prayer", "Amazing Grace", "Dixieland One Step" and "Carnival of Venice", but all your selections were wonderful. On behalf of the patients and staff of the VA Medical Center, may I extend to you and the members of Pyramid Brass, our heartfelt appreciation for the fantastic performance on February 17th. Your Quintet performed magnificently! 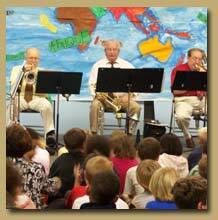 Thanks to you and the other members of the Pyramid Brass for a fantastic concert at Brevard Elementary last week! You played a terrific variety or selections, combined with lots of good information. It was obvious you knew your audience, and that they enjoyed your performance. The music provided by the Pyramid Brass was outstanding. There are not enough superlatives to describe how good they are. They played music from around the world including Christmas Carols and gave us an opportunity to sing with them. It just keeps getting better and better. 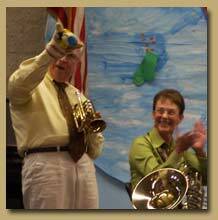 We had a wonderful turn-out for our "Goodbye to Summer" party and the Pyramid Brass made the night a wonderful success. Everyone had a splendid time and when we waved goodbye to the sun as it set over the horizon, I knew that summer was gone for another year. We couldn't have done it without Pyramid Brass. On behalf of the residents and myself, we thank you for the fun and look forward to seeing you next year! I'd just like to take a moment to thank you and the other members of Pyramid Brass Quintet for the wonderful concert that you presented here at the Arts Center last week. Everyone enjoyed the wide range of selections ant the talent that was shared that day. It was the perfect concert for a lovely, sunny afternoon We look forward to having the group perform here again, so let's keep in touch. We want to thank you very much for helping make this time so special for us. Thank you and Pyramid Brass for helping make our wedding so_special. The music was so great-just what we wanted!....Thank you again for being a part of our wonderful start to married life. You are a blessing to us.